I'll be stopping by the dealership today to take a look. I would like to see the oil plug as it was taken from the FD. There is NO way a BMW dealer is replacing a FD for me. I'll be a little more blunt than Gordon. That's a very suspect diagnosis without other findings. Tell 'em thanks for letting me know, but decline the rebuild. Gordon is correct, detectable movement of the wheel on doing a "shake the wheel test" is much more likely to suggest pivot bearing problems. Detectable axial and/or radial wheel movement when grasping the tire and "wiggling" has never been an early indication of a "classic crown wheel bearing failure". There are other failures of final drive components but these too would have findings of abnormal lube color, metal shards or flakes on the drain magnet, etc. Absent those other findings, and only a positive "shake the wheel" test, I'd have zero confidence that they know what they are talking about. Or maybe they just need a little more work in the shop this time of year. I agree. The dealership is not getting the job. I drained the drive and inspected the gear oil and the plug. I'm pulling the drive and sending it to Saddleman. Thanks to all for the never ending stream of good,solid and helpful information. Got the LT back on the road. I swear I can feel the difference in the drive train. Special thanks to Dave (Saddleman). Monitoring oil leak. Looks like the main seal (ouch!). Clutch is still OK. Switched back to Castrol 20W50 conventional and will keep a close eye on it. Good deal on the Saddleman repaired FD. Bad news on the oil leak. If it is the dreaded O-ring in the clutch housing, there is little you can do as it has likely cracked from heat and age and no type of oil will fix that. If it is the rear main seal, Oil type will probably do nothing there either as it is teflon and doesn't care what type of oil you use. If you haven't done it yet, I would drill the bellhousing weep hole and see if you get any oil out. A surprising amount can accumulate inside depending on the condition of the machined surfaces between the housings. The hole can be pretty small and drilled from the outside. The red dot is just for an approximate location of the lowest spot, not an indication of size. Greetings, I joined recently (well I mean showed back up recently) and began reading up on these bikes because a good friend has a 2003 with 20k. He picked it up very inexpensively because apparently the abs reservoir was low enough to cause some code(s) but he bought it on a chance and after that was found it has been a great bike for him the past few months. I currently have a 2005 1150RT with almost 29k and it has been a peach, no FD issues or any other issues the past three years...other than it was the last model made before the 1200 and it has no cruise, lol. (holds up a crippled hand) . I hope to find out Tuesday if he has any maint records from the former owner, too. This K1200 seems to want me to buy it, lol, because it must know I overpack and CANNOT get my Neotec with a Sena 10c to go in the rear top case...maddening. In any case I am interested in the LT but I said all that to say I just finished reading this thread and holy moly lots of knowledge here, I bow to mighty men . The BMW shop here in Oklahoma City has been a good one the past couple of years, lots of care has gone into customer support and the mechanics have a good record among we riders for first-time fixes, etc. Service MGR has gone to extensive BMW schools in Germany and other places and sounds very knowledgeable...I know, a dealership...but...and my long-winded question finally...if I ask them to check out the FD and request they drain and examine the oil as it has been examined by all of you, for fuzz, flakes and possibly wobbling, will this be sufficient or do they as a rule have even more comprehensive tests they do to check for impending or actual FD damage? I expect and hope they will give as honest an answer as they can. I love my RT even though my brain still wants to do single-track (wayyy pre RT) and go on multiple 600 mile day trips but it sounds like the LT will contribute to my comfort big time ...will I be making a lateral move comparing the two FDs with regard to potential failure? I know the RTs have displayed spline problems but the LT seems to also eat clutches...or maybe it is as someone said, more people complain than extol. If the oil looks good with minimal fuzz and no flakes I will be tempted to get it. Thank you for all your efforts in building this site and I hope it will become a frequent haunt for me. Welcome back to the forum Rick. The earlier LT FD's had a higher incidence of incorrect assembly than the later ones but getting a later model in no way gets you completely out of the woods on that as FD failures have happened across the board, just significantly fewer in later years as they seem to have gotten the hang of better assembly. You didn't mention the year of the LT you have your eye on assuming it isn't the one your friend has mentioning looking for service records. I think there are very few shops that would take the time needed to actually do the proper process ( like Saddleman ) and added to that is how many have they done to sharpen their skills at getting it right the first time. I have done 2 myself and it is a job that requires some special tools and skills using them to get right. Shops are in business to make money so anything relayed without first hand viewing ( imo ) is suspect Is a dealer capable of doing the job? depends on the person doing it but not beyond the realm of possibility. Not sure what your mechanical savvy is but it doesn't take much to check.change the oil in a FD so I would be leaning towards a first hand inspection of that drain plug and not trust what a dealer said. That being said, Saddleman is the go to guy if you want it done right should you need the service. Re-shimiming after the fact is not valuable by itself as damage has likely already been done to the bearing from metal fatigue if it is over shimmed and would not likely add much life if any on a bearing that has miles on it. Replacement of the bearing and re-shimming really would be the only viable service to ensure proper operation. There are also other things to look at inside the FD that a dealer may not know to look for or overlook that Saddleman would not. Good luck on your choice. They really are great bikes to ride. Morning! Thank you for the friendly and quick response. It is a 2003 and I have been on a trip already with my buddy and the KT but just admired it from afar so to speak. It is in the shop for a broken valve stem so in the morning I will go in and give it a better look and then ride it. I am not decrepit but it will definitely be the heaviest bike I've thought of owning since an 86 Suzuki Cavalcade back in those days which was a great touring bike for my wife, lots of gadgets, but I doubt it was as heavy as this would be. Your thoughts echo what I was generally thinking. I may ask them to replace the FD fluid just to get a look at the fluid or maybe just offer to do it for my friend once it gets back to his house. Thanks again and if I post any pics of me doing leg presses in the gym you will know I did the deed . I do like tossing the RT around mountain roads in New Mexico so will have to judge if I can still retain a significant percentage of that fun after I ride it. I have been fortunate enough to never run out of road since I was old enough to ride in 1973 so I will probably need to put a big yellow Post-it on the dash that says "mass likes to go straight! No sight-seeing!" You can have plenty of fun on an LT, just not below 5mph They handle amazingly well at speed and ride much lighter than they are. Being heavy isn't the worst of it, it is that the CG is higher than on most bikes so you have to follow a few simple rules like, never try and come to a stop in a turn or with the bars any place other than straight forward and keep your head up looking forward, not down. There is a much smaller angle of recovery in a lean when stopped with that high CG so try not to let it lean over unless you are headed to the side stand intentionally. The servo assist brakes on the 02 can get a little grabby at slow speeds leading to drops if you are not following the rules. Unless you are a long legged behemoth, if it starts to go past the point of no return, just step out and get out of the way and worry about picking it up after. Being able to flat foot her at a stop is a big help in keeping her between tipping points. Most owners have dropped their LT at least once. There is no shame in that We will be looking for those pictures. Help is always available on this forum so don't be afraid to ask. niel_petersen and kbob12 like this. Haha I looked for a Like button, lol...I need help. 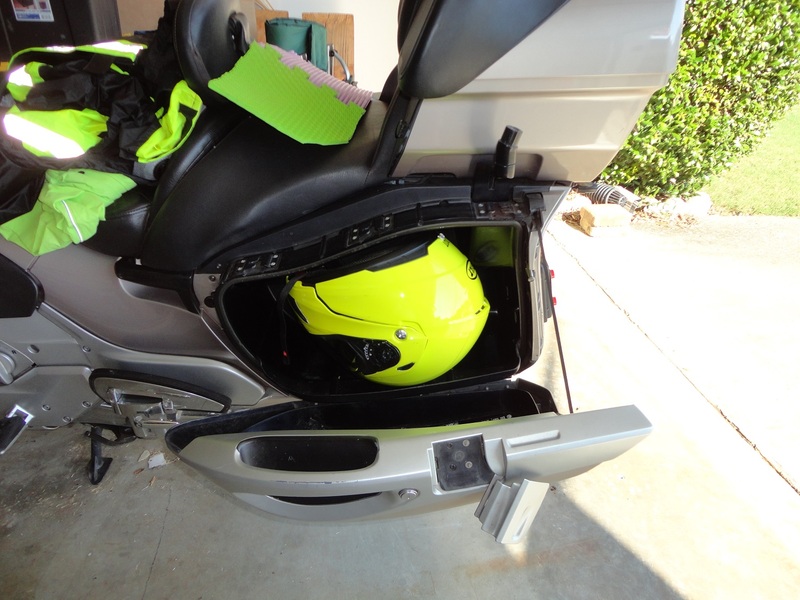 One last question for the road...will a helmet fit in the side cases? 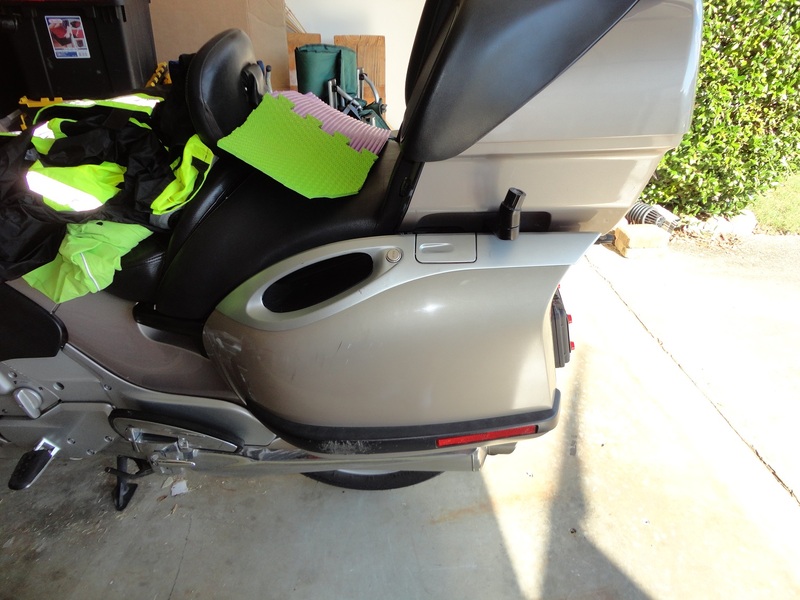 I plan on pulling the cd changer if I get it but the bike looks darned nice with the trunk off. I also plan on doing a four corners with my wing man in the spring, I am hoping a lightly packed duffle strapped there would change the cg a bit. Shutting up now! Last edited by Ricky Chuck; Sep 3rd, 2018 at 10:11 am. I have a medium Built helmet with an SMH10 mounted. It would not close with the intercom out and right side up but flipped, it did close but it was tight. Ignore the scratches, most were there when I bought it. Doing a four corners on an unknown LT is inviting trouble on a 16 year old. Depending on what service has been done to this point, there is a list of things that would greatly increase the chances of success. The MAJOR things that could stop you in your tracks are the FD, a failure of the O-ring in the clutch housing or main seal contaminating the clutch with oil, Failure of the internal tank rubber fuel lines, OEM brake line failure. Any of those that have been addressed recently are a plus like Spiegler SS braided brake lines or having replaced the internal fuel lines in the last few years. If the FD has had the crown bearing replaced, it is a plus even if it was just done with the same shims it came with as you could expect similar duration before another failure. 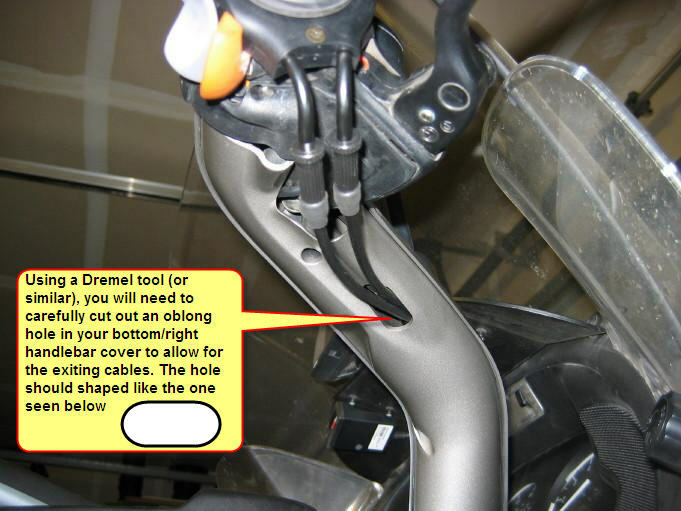 Replacing the OEM brake lines are a must as they deteriorate from the inside and 10, maybe 12 years is their expected life so anything beyond that is potentially pushing your luck. Mine lasted 13 years before bursting. 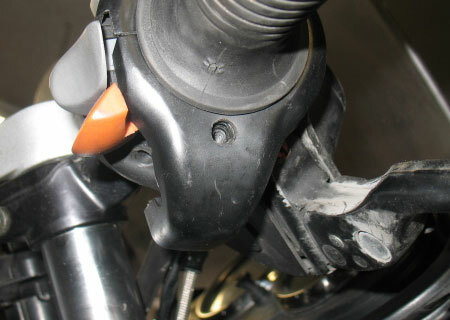 ALso, if it has wuick disconnect fuel connectors, the OEM plastic ones have a very bad habit of cracking and spraying fuel so those need to be replaced with metal ones if not done already. 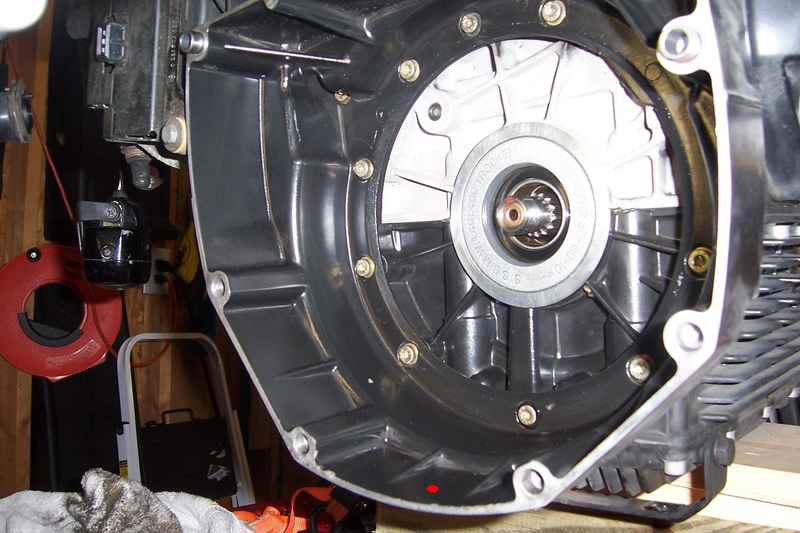 It is a dry clutch and can generate a lot of heat if engaged at higher RPM like a wet clutch can handle so depending on use and environment, the heat in the bellhousing and clutch housing over time causes the O-ring seal to harden and crack allowing oil into the clutch. No way to evaluate that without taking it apart and just replacing it preferably with a Viton one better suited for the higher heat. ANY oil around the bellhousing is bad. Work on keeping the RPM low and feather out the clutch till fully engaged, then roll on the throttle. 1st gear is high so it takes some effort to get her rolling. I would not expect you to just do the clutch as I did before it had any issue. It may run many more miles and never have that particular problem. It mostly would depend on how it was used. It is just being aware of the possible things on that big a ride that could put a sizeable dent in your wallet far from home. Carrying a few things with you like a spare crown bearing and FD seal and a set of replacement fuel lines can provide some comfort and they don't take up too much room if you didn't install them before the ride. As with any bike, at this age, there are things that can go wrong. There just happen to be some biger ticket items in that list of possibilities. It is a love hate relationship and they do need proper care and feeding. Last edited by bmwcoolk1200; Sep 3rd, 2018 at 4:58 pm. Hey, thanks for responding. I have done a lot of reading the past few days and the first three stoppers you mentioned concern me, the other stuff I would plan to upgrade over the next month if I get it. I haven't yet watched Kirk at Illinois BMW replace the o-ring so unsure if it is a major engine dismantle but will find out. I figure a main seal is a biggie, too. This doesn't exactly throw cold water on me, lol, but now I am suddenly thinking in fond terms of my 1150RT, which has been very kind to me . I suppose the best thing is to ask Saddleman what a pre-emptive rebuild would put me out and budget for that in the next few months because this four corners is going to be a kind of bucket list trip. Appreciate the information, lots to think about as I start looking it over more closely tomorrow. I wonder if there are any FD gurus in the mid-southwest, Texas, Missouri, etc? Nothing against sending it off, just trying to get my bearings on logistics. I have been a VW TDI enthusiast since 2000 and all my energy has been on modding those motors...my last several bikes have been bulletproof, even the last two BMWs, 1150R and this one have been almost immaculate. Thanks again. Update: I am suddenly very tired watching how to replace the main seal and clutch o-ring, lol. Last edited by Ricky Chuck; Sep 3rd, 2018 at 7:30 pm. Apparently I am so new I cannot send PMs, lol. If someone would be kind enough to ask Saddleman to PM me I would like to get an estimate on sending him a functioning (to my knowledge) FD off a 2003 K and getting it refurbed correctly, thank you. You are up to six now! I can't PM you until you have 15 post so keep posting. Thanks! Was about to do that last night then life intruded. Greetings, shout out for Saddleman who was kind enough to speak with me through PM. The Service MGR at the BMW shop and the mechanic who has worked on my former R and the current RT multiple times in the past four years said the FD oil was almost pure as the driven rain, lol...actually he said it was a little darker than karo syrup and there were no leavings at all and just some very tiny amounts of fuzz. I am leaning toward trying to get it and do some maintenance on the other fluids as well as probably the rubber brake lines although those did not look weather-cracked and felt pretty springy. Spiegler kit for me I think. Thank you for all the great opinions. I will let you know in the next couple of days how it goes. Saddleman gave me a tip that after riding it on the Interstate for a while I should touch the FD and if my hand can stay on it without discomfort (my word) it is probably shimmed pretty good. I realize there are no guarantees with these FDs but grateful for the tip anyway . Rick, if the lines are spongy, I would not take that as a good sign. They deteriorate from the inside out so they can look great but still be crap waiting to fail when you need them most. Just another tip. I grok, I'm going to order the Spiegler kit as soon as I get it. I did learn something else of potential substance, though...while they were looking over the throttle cable which they ultimately figured out needed a little lube I guess up by the top portion, Kelly the Service MGR looked up a replacement...apparently they now have some type of retrofit kit that has to go in in some very tedious manner that costs about 400 bucks and takes a couple hours to put together...jeez, getting old usually is not good, lol. Yes, there is a retrofit kit for the stiff throttle some of the early LT's had an issue with. It requires cutting some part in that assembly to get all the new pieces to install right. Pics below to know if you have the new already on the left or old on the right.